We are all feeling it. So how do we react to it – and what is it doing to us !! Well, the good news is that a bit of stress is actually really good for you. Your brain function improves and your capacity to do what you need to quickly also increases. 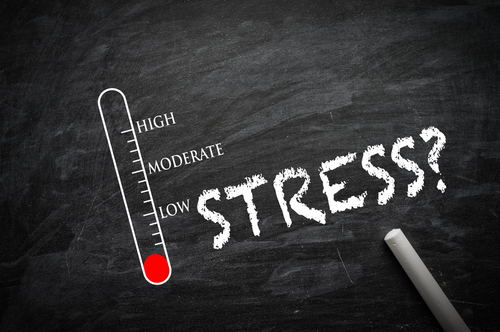 Researcher and Associate Professor, Daniela Kaufer says ” You always think about stress as a really bad thing, but it’s not, some amounts of stress are good to push you just to the level of optimal alertness, behavioural and cognitive performance. ” She has shown how intermittent stress is actually good for your brain function as well as the proliferation of neural stem cells in the hippocampus, improving your memory. Bear in mind that your hippocampus, located within the medial temporal lobe of the brain, forms part of your limbic system – which regulates your emotions – and is primarily associated with memory, especially long term memory and spatial navigation. Also bear in mind that the hippocampus is really super sensitive to glucocorticoid stress hormones, mainly cortisol, and that chronic stress, on the other hand, can lead to the suppression of the production of fresh and new neurons in your brain. So, the bad news is that too much stress is not good for you at all, and can lead to all kinds of diverse and seemingly unrelated health problems including problems with mood, memory and brain function. Cortisol is a steroid hormone which regulates arousal, cognition, mood, sleep, metabolism, maintenance of cardiovascular tone, the immune and inflammatory response, as well as growth and reproduction. Chronic overexposure to cortisol can lead to obesity, sleep deprivation, lipid abnormalities, hypertension, diabetes, atherosclerosis, and loss of bone density, as well as severely deplete protein stores in muscle, bone, connective tissue and skin. Phew. That’s not something any of us need – right ! And if we look at how your immune systems function, this is a blueprint, as on the positive side, your immune system is fostered and strengthened by small intermittent exposure to pathogens, which cause a temporary stress in the body, and in doing so, stimulates the body to produce antigens to fight off disease now, and in the future. The opposite happens if you are exposed consistently and intensively to multiple and extensive pathogens for too long. Eventually you’re more likely to suffer from chronic illness as your body simply cannot cope with the overload. Stress is the same. Short bursts are good, long term ongoing stress is not. When your body is undergoing high levels of stress, it diverts progesterone to the adrenals to manufacture cortisol. And yes – men have progesterone and oestrogen just like women have testosterone. When stress is prolonged, high levels of cortisol remain in your body and you can begin to suffer from adrenal fatigue, and oestrogen excess – as your progesterone is being used to produce all that cortisol, putting your hormones right out of whack. For women, herein lies a trigger for PMT – menstrual migraines, endometriosis, skin problems, depression and crying, insomnia, painful breasts. heavy bleeding, the list goes on. And to throw another carrot into the soup – poor sleep (usually associated with chronic stress) causes a reduction in the production of melatonin, and guess what melatonin does ??? Helps protect against oestrogen dominance. Such a beautiful cycle. So you can see the complexity of the physiology of the body with just one hormone as a main player being able to disrupt your finely tuned natural systems. And now, you can see how important it is to address the stress levels in your life if they are too high, so that you can protect and preserve your long term health and wellbeing. If you aren’t eliminating your food properly you may need something temporarily to gently tonify your digestive and bowel function and get things moving in the right direction… speak with one of our Natural Health consultants today for the right advice for you. Reduce environmental toxins – don’t heat your food in plastic containers please ! My pet hate ! Xenestrogens can leach out from the plastic into your food – these are foreign synthetic oestrogens and they are not good for our bodies or our hormonal balance. Detergents and skincare products can also contain these environmental toxins and others such as phthalates – which are known endocrine disrupters, so be discerning as there are plenty of alternatives and they don’t have to be expensive. In fact they are often cheaper as they go further. We have heaps of alternatives at Sage, this is our mission, keeping us healthy and well with good choices available all in one accessible, and kind of cute, space. Improve your liver function – have a break from the daily glass/es of wine or beer, drink lots of water – add in a yummy Beauty Chef Hydrate or Antioxidant probiotic concentrate for even more free radical benefits, and eat bitter foods like rocket and horseradish to get your liver going. Have a chat to us about a little detox if you like, or we can make you up some nice livery herbs to down each morning. Mmmmm. Sleep, and if you can’t or don’t sleep well, speak to one of our natural health practitioners about various herbs and supplements such as magnesium, passionflower, valerian, hop, magnolia and Kava. 5HTP is a naturally occurring amino acid and involved in the biosynthesis of serotonin and melatonin from L-trytophan. It works by increasing the production of serotonin, which is responsible for healthy mood, sleep and even can help with migraine and pmt. Acupuncture and massage can also help with improving sleep and as most of your know we have remedial massage therapists available every day and our acupuncturist Yvette available after work on Mondays and Fridays. Do what works for you to reduce your stress, meditate, run, swim, be alone, read, write, paint, draw, do something with a regular group of people. Say “Sorry not today” to doing one more thing. Chill with your family or friends, fix the car or fix the fence ! Do some yoga, have a massage, facial or acupuncture, and share how you feel with people you trust and are close to. Don’t sandbag it, get it out – talk about it, share and connect with one another. We all have our moments and we all need to get things off our chests and feel the relief of a kind word and a calming influence. And remember, you can still achieve a lot. Your life doesn’t have to stop to deal with stress. 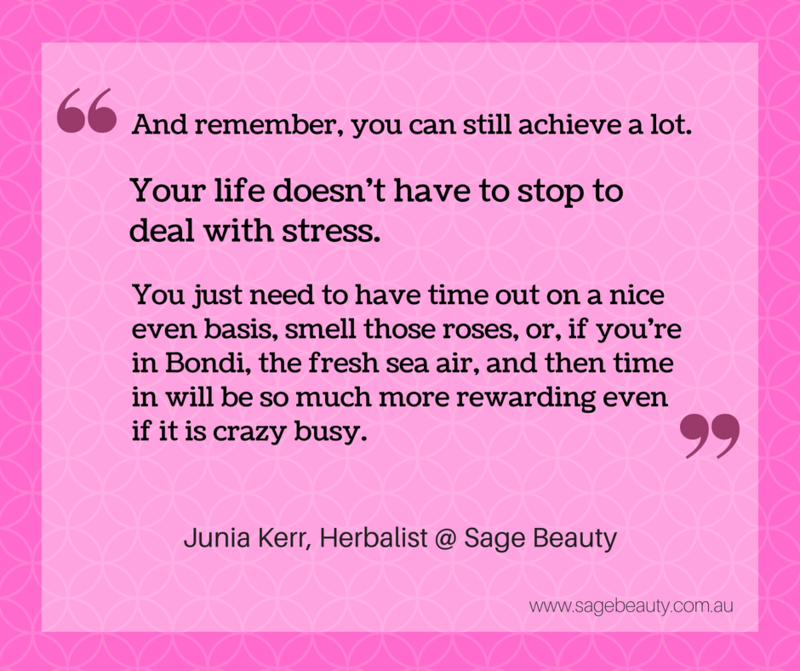 You just have to have time out on a nice even basis, smell those roses or, in Bondi, the fresh sea air, and then time in will be so much more rewarding even if it is crazy busy. Need some help de-stressing naturally? Call us today on 02 9130 7064 or send us a message. 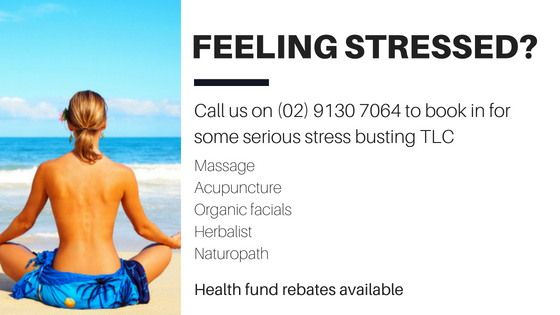 We offer a range of treatments designed to help de-stress and reduce cortisol. Don’t live in Sydney or near North Bondi? Our herbalist and naturopath can do video consultations to help tackle stress induced sleep and hormonal problems. Worried about chemicals in your skin care or make-up causing further toxic stress to your body? Our wholistic beauty therapist can put together natural, effective and toxin free skin care and make up packages recommended specifically for your skin and health AND post them to anywhere in Australia and beyond.